From honeymoons to family holidays, business travel to a long haul luxury holiday, exhibition participation to a pleasant vacation, Hotels.md acts as your personal travel agent and can make your trip a truly unforgettable experience. Our company's commitment is to offer our customers the highest possible levels of personal service. 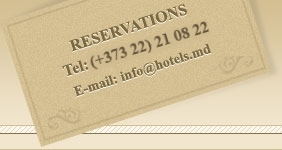 Please give us a call (or fill the form below) if you would like us to to assist you with your trip to Moldova.